Russia will spread her errors throughout the world raising up wars and persecutions against the Church, the good will be martyred, the Holy Father will have much to suffer, various nations will be annihilated. The German magazine "Stimme des Glaubens," has published the following account of Pope John Paul II's interview, with a small group of German Catholics, on the occasion of his visit to Fuida, in November of 1980. We are reproducing it here for the benefit of our readers. 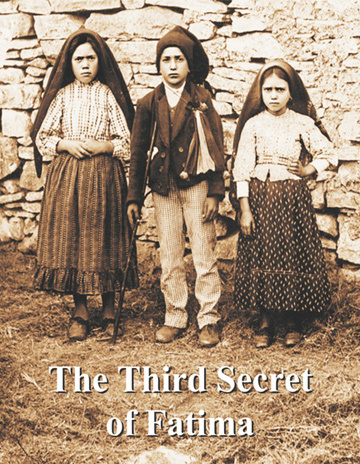 THE QUESTION: "Holy Father, what has become of the 3rd Secret of Fatima? According to Our Lady's instructions, wasn't it supposed to be revealed in 1960? And what will happen in the Church?" 'THE HOLY FATHER'S RESPONSE: "Because of the seriousness of its contents, in order not to encourage the world wide power of Communism to carry out certain coups, my Prederessors in the Chair of Peter have diplomatically preferred to withhold its publication. "On the other hand, it should be sufficient for all Christians to know this much: if there is a message in which it is said that the oceans will flood entire sections of the earth; that, from one moment to the other, millions of people will perish...there is no longer any point in really wanting to publish this secret message. "Many want to know merely out of curiosity, or because of their taste for sensationalism, but they forget that 'to know' implies for them a responsibility. It is dangerous to want to satisfy one's curiosity only, if one is convinced that we can do nothing aganst a catastrophe that has been predicted." At this point, the Holy Father took hold of his Rosary and said: "Here is the remedy against the evil! Pray, pray and ask for nothing else. Put everything in the hands of the Mother of God!" Then he went on to say: "We must be prepared to undergo great trials in the not-to-distant future; trials that will require us to be ready to give up even our lives, and a total gift of self to Christ and for Christ. Through your prayers and mine, it is possible to alleviate this tribulation, but it is no longer possible to avert it, because it is only in this way that the Church can be effectively renewed. How many times, indeed, has the renewal of the Church been effected in blood? This time, again, it will not be otherwise. "We must be strong, we must prepare ourselves, we must entrust ourselves to Christ and to His holy Mother, and we must be attentive, very attentive, to the prayer of the Rosary. " She was a Foundress of a religious order, a holy nun, a victim soul, and Stigmatist.
" . . . if people . . . do not return to God with truly Christian living, another terrible war will come from the East to the West. Russia with her secret armies will battle America: will overrun Europe. The river Rhine will be overflowing with corpses and blood. Italy will also be harassed by a great revolution, and the Pope will suffer terribly." "Oh, what a horrible vision I see! A great revolution is going on in Rome! They are entering the Vatican. The Pope is all alone; he is praying. They are holding the Pope. They take him by force. They knock him down to the floor. They are tying him. Oh. God! Oh, God! They are kicking him. What a horrible scene! How dreadful!" "Russia will march upon all the nations of Europe, particularly Italy, and will raise her flag over the dome of St. Peter's. Italy will be severely tried by a great revolution, and Rome will be purified in blood for its many sins, especially those of impurity. The flock is about to be dispersed and the Pope will suffer greatly." (Albert J. Hebert, Prophecies! the Chastisement and Purification!). Joseph Stalin stated that after Communism succeds, "...then, there will come a peace across the earth". Karl Marx said, "...the meaning of peace is the absence of opposition to Socialism". "War to the hilt between communism and capitalism is inevitable. Today, of course, we are not strong enough to attack. Our time will come in 20 to 30 years. To win, we shall need the element of surprise. The bourgeoisie will have to be put to sleep. So we shall begin by launching the most spectacular peace movement on record. There will be electrifying overtures and unheard-of concessions. The capitalist countries, stupid and decadent, will rejoice to cooperate in their own destruction. They will leap at another chance to be friends. As soon as their guard is down, we shall smash them with our clenched fist. "....In October 1917, we parted with the old world, rejecting it once and for all. We are moving toward a new world, a world of Communism. We shall never turn off that road." "The American people will never knowingly adopt Socialism. But under the name of "liberalism" they will adopt every fragment of the Socialist program, until one day America will be a Socialist nation, without knowing how it happened." '...The age of nations must end....The governments of the nations have decided to order their separate sovereignities into one government to which they surrender their arms." pledge to worship Lucifer. No one will enter the New Age unless he will take a Luciferian Initiation." "Every child in America who enters school at the age of five is mentally ill, because he comes to school with an allegiance to our institutions, toward the preservation of this form of government that we have. Patriotism, nationalism, and sovereignty, all that proves that children are sick because a truly well individual is one who has rejected all of those things, and is truly the international child of the future." The Blessed Virgin Mary has reportedly been appearing to six young people in Bosnia and Hercegovina (former Yugoslavia), since 1981. Throughout the period since the Blessed Virgin first appeared to them, the visionaries claim to have received specific information and teaching from her. The Madonna has repeatedly told the children that the world is on the brink of a major catastrophe. She pleads with us to believe that the great catastrophe facing us can only be turned away through prayer, sacrifice, and penance. The Virgin has repeatedly stated that sin is what causes the lack of peace in the world; and that as long as man continues to ignore God, we will never have peace. LIBOR BROM, emeritus profesor of Russian studies and Eastern European expert at the University of Denver, served as president of the World Representation of Czechoslovak Exiles and chairman of the Czech World Union. Manuilsky, a prominent Soviet professor at the School of Political Warfare, said: "The bourgeoisie will have to be put to sleep. We shall begln by Launching the most spectacular peace movement on record. There will be electrifying overtures and unheard-of concessions. The capitalist countries, stupid and decadent, will rejoice to cooperate in their own destruction. They will leap at another chance to be friends." Libor Brom is an emeritus professor of Foreign Languages and Literatures and director of Russian Area Studies at the University of Denver. In addition, he has lectured at numerous institutions of leaming and before many civic and religious groups on education, literature, and inrernational relations. He has appeared on three continents and often on radio and television. A native Czechoslovakian, Dr. Brom is an American citizen. He received his education at the Czechoslovak Institute of Technology, School of Economics, the Charles University of Prague, School of law, the San Francisco State University, and the University of Colorado. As a professor in the United States, he was selected by the Modern Ianguage Association of America as the Teacher wih Superlative Performance, named The American by Choice in Colorado, and received a National Americanism Medal. In the College Book by the Ballantine Books of New York, 19841 he is named Denver University's best professor. Dr. Brom served in the leadership of many national and international organizations and was imprisoned by both the Nazis and the Communists. He is listed in Who'S Who in America and Who's Who in the Morld.